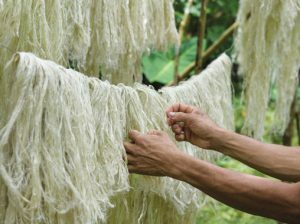 Ananas Anam’s Piñatex® nonwovens are created using long fibers extracted from pineapple leaves discarded after the fruit harvest. Piñatex® nonwovens begin life as pineapple leaves. The innovative plant-based textile is the brain child of Dr. Carmen Hijosa, a leathergoods expert who was shocked to learn about the environmental impact of mass leather production and chemical tanning. She was compelled to consider a sustainable alternative that could be commercially produced, as well as offer a positive social and economic impact with a low environmental footprint. Inspired by natural fibers used in traditional Filipino wovens such as Barong Tagalog garments, Dr. Hijosa began her research during which the pineapple leaf fibers — which are fine, but also offer strength and flexibility — struck Dr. Hijosa as a commercially viable starting material for a fabric. Over a seven year period, Hijosa developed Piñatex, which is available through London-based Ananas Anam Ltd. Some 13 million metric tons of pineapple leaves each year typically are burned or left to rot after the fruit is harvested. Using the discarded leaves for Piñatex doesn’t require any additional land, water, fertilizer or pesticides and can provide additional income opportunities for pineapple farming communities. The pineapple leaves go through seven steps on their way to becoming Piñatex — harvesting, decorticating, washing, drying, degumming, nonwoven formation and finishing. Decortication involves extracting the long fibers from the leaves. Biomass generated during the process may be used as a natural fertilizer or biofuel, so nothing is wasted. After the gum is removed from the fibers, they are made into a nonwoven mesh, which is finished in Spain. 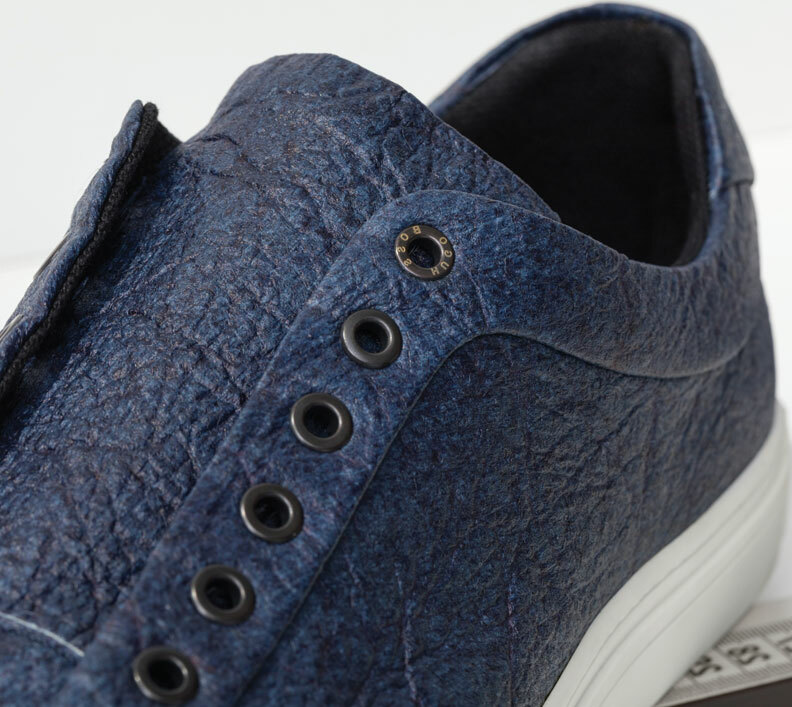 The specialized finishing process gives the nonwoven material a unique character and leather-like appearance. Bonditex SL and Acabados Gonzalez SL, both based in Spain, finish the mesh. According to Ananas Anam, Piñatex is soft, lightweight, durable, flexible and breathable. The nonwoven has applications in a multitude of products from apparel, accessories and footwear to furniture and automotive upholstery. BOSS Menswear shoes recently introduced by Hugo Boss featuring Piñatex® in the upper were designed to make a minimal impact on the planet. The Hugo Boss shoes are 100-percent vegan featuring the Piñatex nonwoven dyed using natural plant-based dyes, and a recycled thermoplastic polyurethane sole. For more information about Piñatex, contact info@ananas-anam.com; ananas-anam.com; instagram.com/pinatex; facebook.com/pinatex.